Affordability problems for American renters have skyrocketed over the past decade, both in number and the share of renters facing them. The inability of so many to find housing they can afford dramatically impacts the health and well-being of renters, as lower-income households cut back on food, healthcare, and savings, just to keep up. 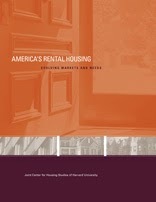 Our new report, America’s Rental Housing: Evolving Markets and Needs, will be released next Monday December 9 in Washington, DC. The daylong event will feature a keynote address from HUD Secretary Shaun Donovan as well as remarks by Colorado Governor John Hickenlooper, Senator Mark Warner of Virginia, and many others. The event will be webcast live from 11:30 a.m. – 4:30 p.m. (Eastern) at www.jchs.harvard.edu. This new report on America's rental housing finds that half of U.S. renters pay more than 30 percent or more of their income on rent, up an astonishing 12 percentage points from a decade earlier. Much of the increase was among renters facing severe burdens (paying more than half their income on rent), boosting their share to 27 percent. These levels were unimaginable just a decade ago, when the share of Americans renters paying half their income on housing, at 19 percent, was already a cause for serious concern. Tune into the webcast on Monday for more findings from this new report.